The Montana Clematis Flower Motif Stencil depicts a full cluster of beautiful Montana Clematis flowers, buds and trailing leaves – arranged as a delicate but large frieze – ideal for stencilling on panels, on feature walls, in alcoves, above beds and anywhere where you want to create a stunning feature. 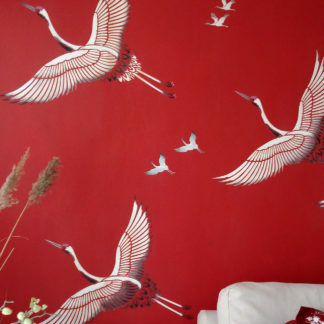 Also amazing stencilled onto fabric for big pattern effects. 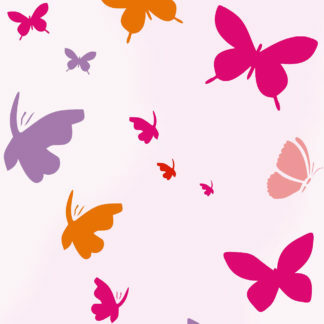 One large sheet stencil – see size and layout specifications below. 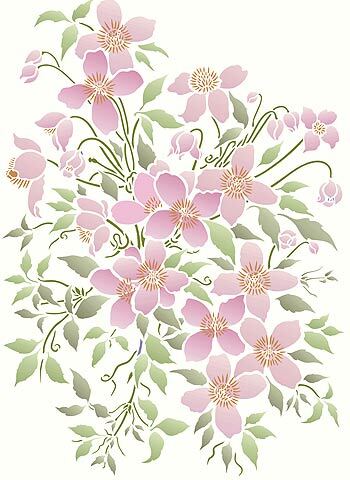 Stencil the Montana Flower Clematis Motif using single colours to create silhouette style finishes, or use a range of bright tones for modern bright colourful effects, or use naturalistic tones of pinks and green to mirror nature. 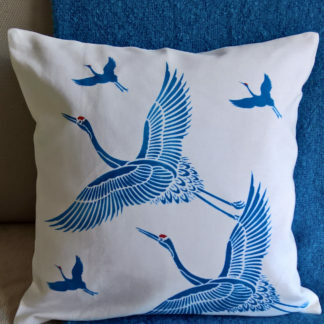 Try an amazing coloured creation (top right) in reds and pinks for a modern country look, or just elegant white and navy on French grey for simple style (below). Each colour combination will create a different effect – see the examples on this page for a range of different colour ideas. 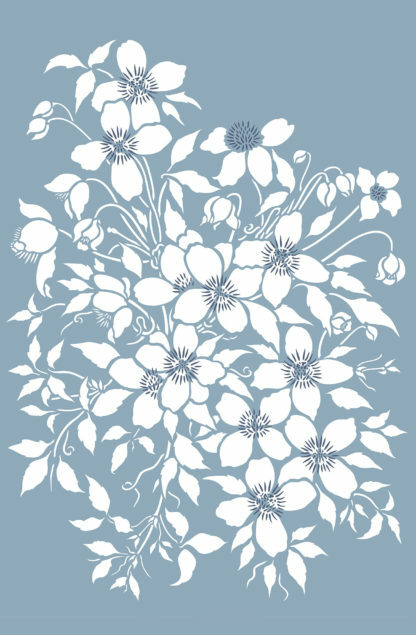 Above top – Montana Clematis Flower Motif in Ice White and Navy Charcoal Stencil Paint on a French grey background. 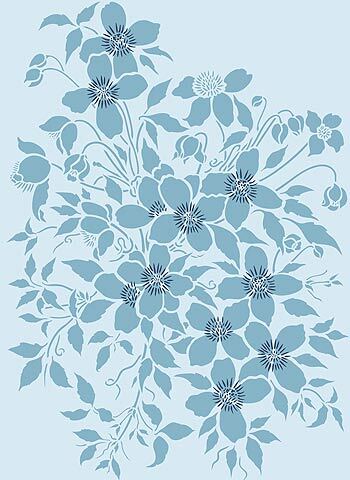 Above – this elegant tone on tone colour scheme perfectly suits the Montana Clematis Flower Motif – stencilled here in Indian Ocean mixed with a little Navy Charcoal Stencil Paint, with stamens in Navy Charcoal Stencil Paint on a chalky blue background. 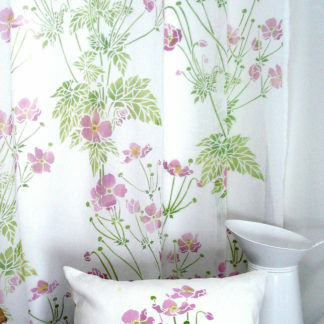 Above – the beauty of tone on tone colour schemes perfectly suit the Montana Clematis Flower Motif – stencilled here in French Lavender and Agapanthus Stencil Paint on a pale blue background. 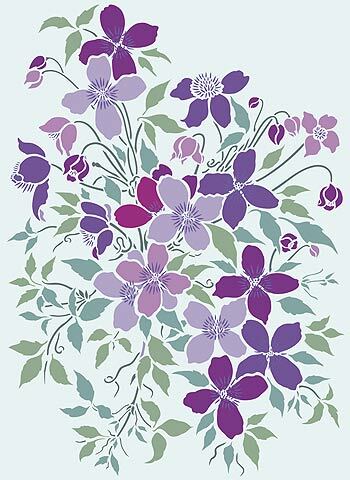 Above – the Montana Clematis Flower Motif stencilled in close-toned lilacs and greens to create a restful and elegant colour scheme. Colours used here Forget-me-not, Alba Rose, French Lavender, Indian Purple Stencil Paint (flowers) and Eucalyptus and Hedgerow Stencil Paint (leaves), with stamens in French Lavender Stencil Paint on a pale grey background. 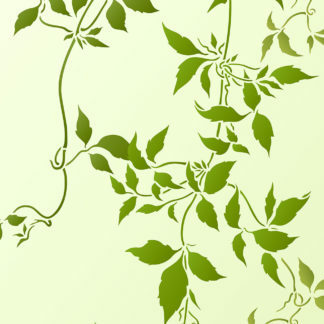 The Oversize, Large and Small Montana Clematis Stencils can be used in conjunction with the Trailing Leaves Stencils – which are the leaves of the Montana Clematis – both sets of designs have been created to work with each other – see: Trailing Leaves Theme Pack and the Large Trailing Leaves Stencil. 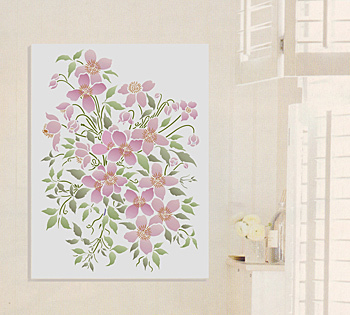 Above – the Montana Clematis Flower Motif stencilled in soft pinks in a pretty, pastel tone bathroom for a soft, light pictorial effect. See close up example and colours listed below. 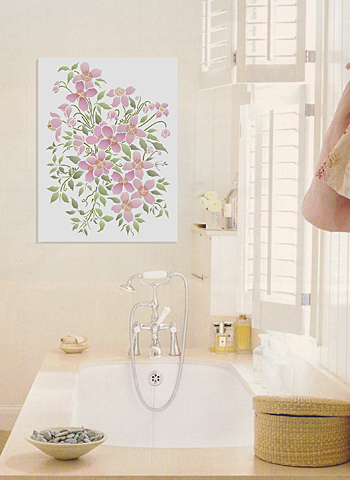 Above – To create these pretty delicate pastel tones (as shown in the bathroom picture above) use our in Orchid, Alba Rose and English Rose (flowers), Bamboo Grove, Spring Vine and Willow (leaves) Stencil Paints, with stamens in Harvest Gold and Chocolat Stencil Paint. Below – close up detail of bathroom panel. 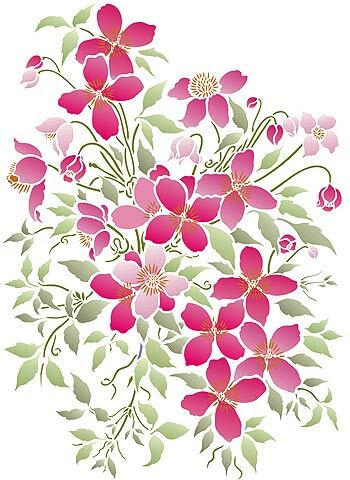 Above – Create this modern ‘country’ display of colour with the Montana Clematis Flower Motif stencilled in Cerise, Very Berry, Orchid, Alba Rose, (flowers), Willow, Spring Vine, Hedgerow (leaves) Stencil Paint, with stamens in Harvest Gold and Chocolat Stencil Paint. 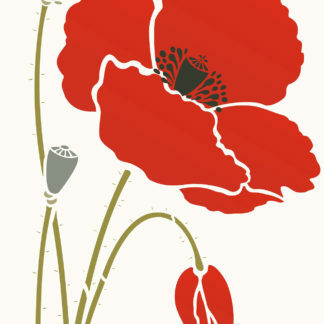 Use Stencil Sponges to blend paints together on the stencil for this 3D look on petals and leaves. 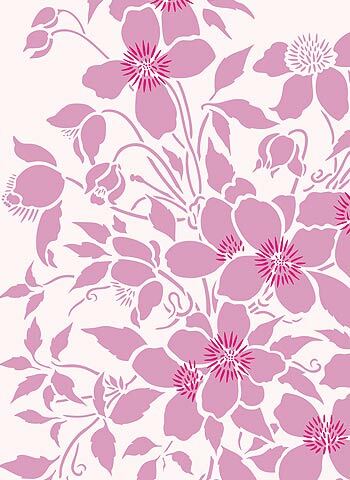 Above – close up detail of the Montana Clematis Flower Motif in Alba Rose with stamens in Cerise Stencil Paint. 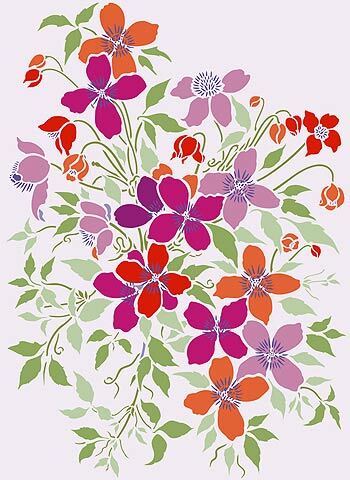 Above – the Montana Clematis Flower Motif looks stunning and contemporary in a bright multi-colured palette. Stencilled here in Alba Rose, Indian Purple, Agapanthus, Very Berry, and Seville Orange(flowers) and Verbena and Spearmint Stencil Paint (leaves) with stamens in China Blue Stencil Paint. 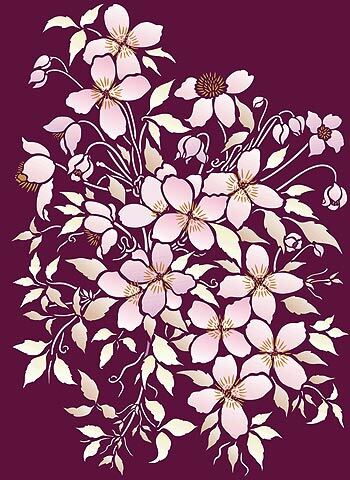 Above – Montana Clematis Flower Motif stencilled on rich and royal burgundy in an ‘almost silhouette’ style in Ice White, Orchid, Spearmint Stencil Paint – colours blended together on the stencil using Stencil Sponges. Stamens in Latte Stencil Paint (Latte also used to lightly ‘blush’ edges of some leaves). 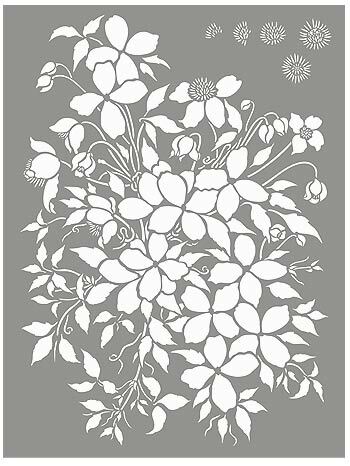 Easy to use one layer stencil on one sheet with additional stamen motifs to add on top of stencilled flowers. 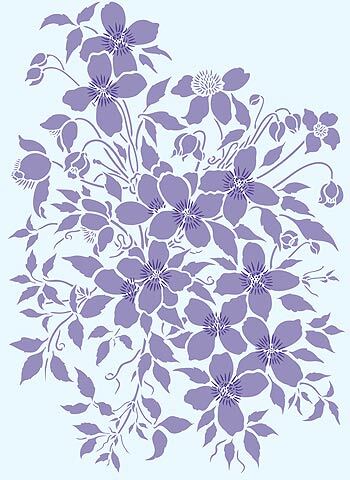 The Montana Clematis Motif Stencil design is 61cm (24″) wide x 86cm (33 3/4″) deep on a sheet 68cm (26 3/4″) wide x 90cm (35 1/2″) deep. Flowers up to approximately 15cm (6″) wide. 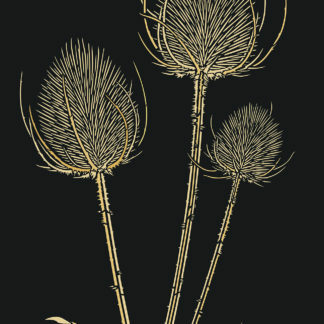 Diameter of stamens up to 6cm (2 1/4″). 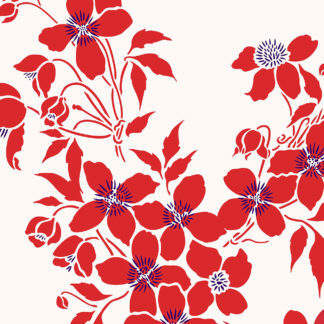 Left – layout of the Montana Clematis Flower Motif Stencil – shows the main flower motif and stamen details for stencilling on top of main flower motif (top right of sheet).